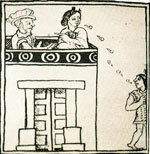 The initial tactic of the Spanish Church was to use force: not only were Aztec temples pulled down but Aztec screenfold books were burnt (see main picture and pic 1) in their thousands (today only 16 pre-Hispanic ones are known still to exist - ironically, ones sent over from Mexico as exotic gifts to the Spanish King). The violence was backed up with arguments: could the natives not see that, though human sacrifice had ended, the Sun still rose and set each day?! 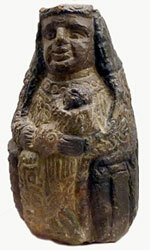 Far from surrendering their beliefs, though, the Nahua (descendants of the Aztecs) went underground, in multiple forms of ‘cultural resistance’: Aztec religious icons were hidden in churches (sometimes built into new church walls themselves), old deities were disguised as Christian Saints (fertility gods in particular remaining popular to this day), they refused to enter the new ‘temples’, forcing the Church to accept holding mass and other ceremonies outside, the Days of the Dead (an ancient festival) is today far more popular than the Catholic All Souls Day in Mexico, the idea of Christ’s virgin birth was easily accepted by the locals (that’s how Huitzilopochtli had been born, after all! ), and terms completely foreign to the Nahua, such as ‘sin’, had to be watered down in translation: ‘evil’ in Nahuatl could only be expressed as ahmo cualli (‘not good’). About the only item that the Catholic Church was 100% successful in imposing on the locals was trousers for men! The Nahua had to fight hard to keep themselves and their traditions alive: under Spanish rule it was a case of ‘adapt or die’. The country, like its people, became a mixed-blood (mestizo) New World/Old World melting-pot. 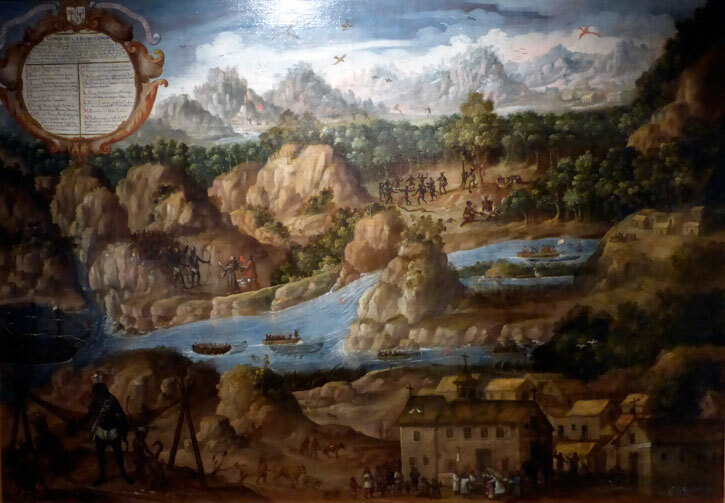 Some hangovers from before the invasion didn’t stand a chance: being of noble Aztec descent was quickly devalued, the Spanish authorities prioritising individual achievement instead (by mid-17th century all ‘nobles’ had become commoners). The landscape was badly affected too: for starters, the Spanish, wrongly believing it to be disease-ridden, became obsessed with draining and filling in Lake Texcoco which the Aztecs had managed so successfully (it never recovered); trees were wantonly cut down with resulting land erosion (wood was in high demand for lumber, fuel, lime production, building supports...); land used for centuries for growing traditional subsistence crops was turned over to livestock raising and to new cash crops such as sugarcane and coffee. A dual economy was born: local subsistence - on the poorest land - alongside an import-export market designed to provide a superior standard of living for Spanish colonialists. • Pix 1, 2, 3 & 4: photos by Ian Mursell/Mexicolore. 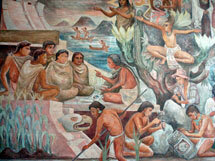 Pic 6: The Aztecs: where does the truth lie...? • The extent of human sacrifice. Were the Spanish accounts biased/exaggerated? • Were the Aztecs ‘primitive’ and ‘inferior’? • Was/is Doña Marina a traitor or heroine? • Did European weaponry/technology win the war? 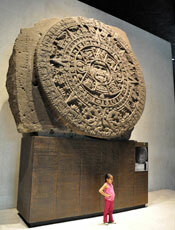 The Aztecs sacrificed 50,000 people per year (1 every 10 minutes! ), 20,000 ‘in a single party’ (p48), and that there were 136,000* skulls on the main skull rack (p109). • If you read Sacrificios Humanos entre los Mexicas y otros Pueblos Indios: ¿Realidad of Fantasía? 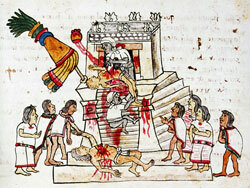 (Human Sacrifices amongst the Aztecs and other Indian Peoples: True or False?) 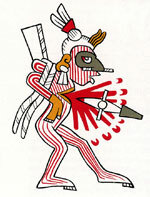 by Peter Hassler, you’ll find this (our translation): ‘We must say there isn’t a single authentic eye-witness account, no communal burial sites for the victims of these supposed mass killings have been found, nor is there a single other proof of institutionalized human sacrifice among the Mexica (Aztecs) and other Indian Peoples’ (Ce-Acatl, 53-54, Nov-Dec 1993, p. 9). • Why might the Spanish want to exaggerate the numbers for human sacrifice? • Why might modern-day Aztec ‘revivalists’ want to deny that human sacrifice took place at all? • Why have the Aztecs always been given a ‘bad press’, and stereotyped as the people who performed most human sacrifice in history? • Most of the ‘classic’ images of Aztec human sacrifice were drawn by scribes AFTER the Conquest, under Spanish direction: what does this tell us? 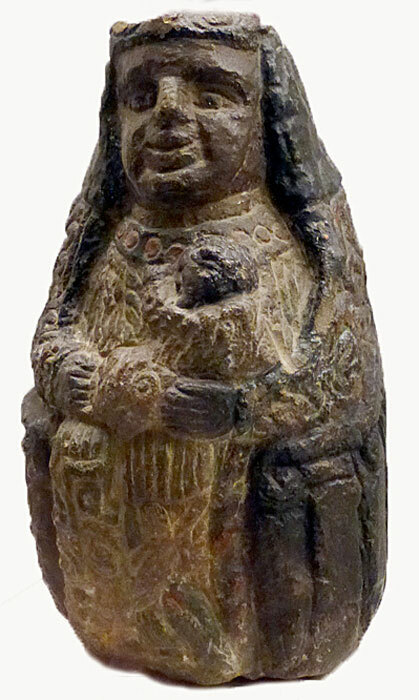 Were the Aztecs ‘primitive’ and ‘inferior’? Was/is Doña Marina a traitor or heroine? they were the bearded ones whose arrival had been foretold by prophecy. And we opened our doors to them out of fear of the unknown. They advanced with fire in their hands all covered in metal. And when the others saw the blood flowing they were overcome with shame. And by the time we realized the truth it was all over. And that one mistake led us to hand over the greatness of our past. And from that one mistake we were to remain slaves for 300 years. Our faith, our culture, our bread, our money. And we hand over our wealth in return for their shiny mirrors. And we open our homes to them and call them our friends. We humiliate him and make him feel like a stranger in his own land. Your own brothers and sisters with venom. When will you leave my land, when will you let my people go free? For years it was ’50/50’: there are several Spanish accounts saying he was stoned to death by his own people, but then there are several indigenous accounts saying he was murdered by the Spanish. 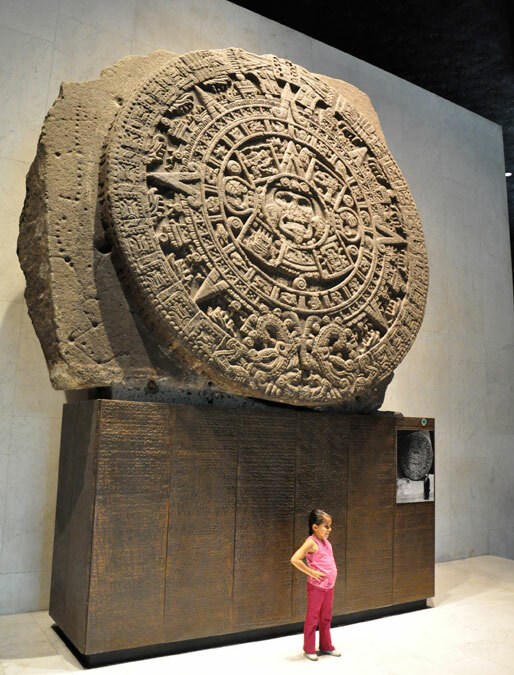 However a new piece of evidence only came to light a few years ago, and was exhibited for the first time in the major Moctezuma Aztec Ruler exhibition at the British Museum (2009-10) - the Codex Moctezuma, thought to have been painted in the late 16th or early 17th century. It now lives in Mexico, but is in quite poor condition. 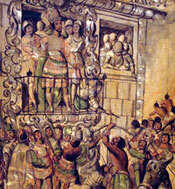 Study the crucial section in the middle, where you can see Moctezuma addressing his people from a parapet. Have a close look to see who is really manipulating the events from behind... (See/enlarge picture 6 in Part Two). Did European weaponry/technology win the war?